Since they first have been used in astronomy in the second half of the seventies a lot of enthusiasm, tales, disillusion and mysteries spun around the use and usefulness of optical fibers in astronomy. Within almost 30 years fibers have been used with increasing success to decouple astronomical instruments from the telescope and to split the telescope focal plane into up to thousands of subchannels. 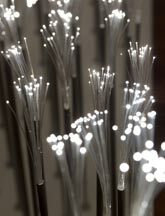 Both applications, the single fiber that is used to physically decouple telescope and spectrograph as well as the socalled Integral Field Unit that subdivides the information at the telescopes focal plane into subchannels of fiber diamteres size are in the focus of my fiber optical work. This work is done for the high resolution spectrographs FOCES and LAMOST/HiRes as well as for the over 30000 channel low resolution VIRUS/HETDEX project. Both projects, though very different in their targets and scientific goals, require the precise knowladge about fiber properties.